Born on a farm near Halifax, Vermont, the youngest of six children, Otis made several attempts at establishing businesses in his early years. However, chronically poor health led to continual financial woes. Finally, in 1845, he tried to change his luck with a move to Albany, New York where he worked as a master mechanic in the bedstead factory of O. Tingley & Company. He remained about three years and during that period invented and put into use a railway safety brake, which could be controlled by the engineer, and ingenious devices to run rails for four-poster beds and to improve the operation of turbine wheels. By 1852 he had moved to Yonkers, New York, to organize and install machinery for the bedstead firm of Maize & Burns, which was expanding. Josiah Maize needed a hoist to lift heavy equipment to the upper floor. Although hoists were not new, Otis' inventive nature had been stimulated because of the equipment's safety problem. If one could just devise a device that would prevent the elevator from falling if the rope broke! .... He hit upon the answer, a tough, steel wagon spring meshing with a ratchet. If the rope gave way, the spring would catch and hold. In 1854 Otis dramatized his safety device on the floor of the Crystal Palace Exposition in New York. 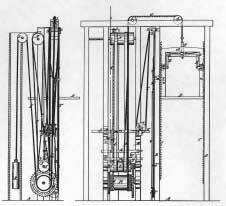 With a large audience on hand, the inventor ascended in an elevator cradled in an open-sided shaft. Halfway up, he had the hoisting rope cut with an axe. The platform held fast and the elevator industry was on its way. Otis had no way of knowing that this simple safety device was to change the attitude of the public towards be lifted within multi-storied buildings. Elisha Otis followed his demonstration with the patenting of an "Improved Hoisting Apparatus in 1861. Claimed as original were an automatic safety device (same as in 1854), shipper ropes, a combined belt-shipper and brake mechanism and lastly, a counter poise weight (see accompanying graphic).